How is your Christmas list looking this year? 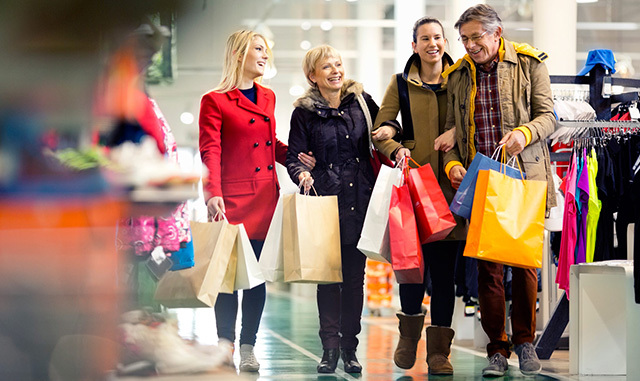 Check everyone off your list when you visit Tanger Outlets just down the road from our Pigeon Forge hotel. Not only can you browse dozens of your favorite brand-name stores, you can save 20-40%! Tanger Outlets is famous for knocking the prices to an amazing discount on everything from fashion and footwear to apparel and home decor. With Thanksgiving right around the corner, it's also time to gear up for Black Friday sales. Tanger Outlets is famous for its after-Thanksgiving sale with even deeper discounts than usual. Get a jump on the crowds and stay at our comfortable hotel in Pigeon Forge. You can start your Christmas shopping outing with a complimentary breakfast to gear up for your big day. From December 1 to 23, Tanger Outlets has extended hours during the week and until 10 pm on Friday and Saturday evenings. No matter if you're shopping for your kids, family members, or close friends, there's something for everyone's Christmas list at Tanger Outlets. The list of shops is truly incredible. You'll find a Nike Factory Store, Brooks Brother Factory Store, Zales Diamond Store Outlet, Toys "R" Us Outlet, Polo Ralph Lauren Factory Store, and Disney Outlet just to name few. To see the full list, check out the Tanger Outlets official website. Located in nearby Sevierville, Tanger Outlets is easy to reach when you stay at our hotel. In fact, our Pigeon Forge accommodations are less than a mile away! Hop in your car and be shopping in less than ten minutes.